Flood Defense meeting and LCRA Annual General Meeting – Get Involved!!!!!! 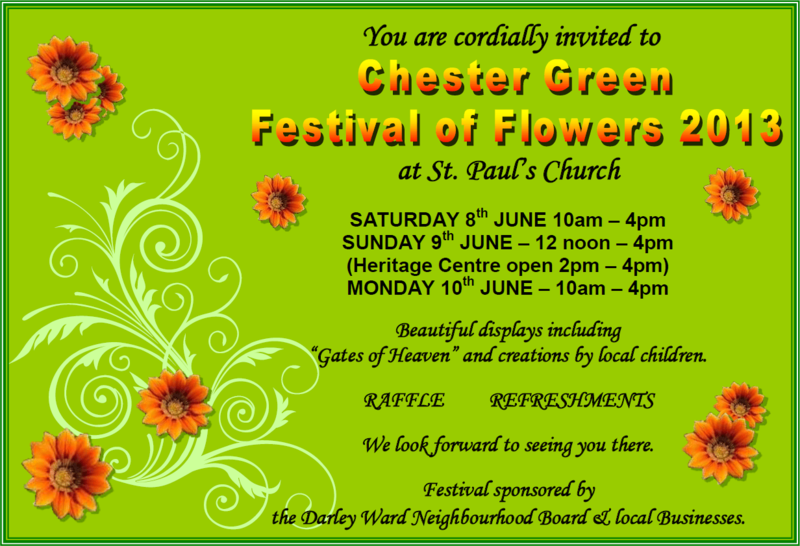 Flower Festival – 7 weeks to go…..
Chester Green Brownies need YOU! If you haven’t seen Parker’s Piece of late, you won’t have noticed the archaeological works going on at the moment…..for more details, click the links below! BBC News – Digging starts along River Derwent to uncover a Roman fort in Derby. Archaeologists hoping Chester Green cricket pitch dig runs into fine catch of Roman relics | This is Derbyshire. Darley Abbey History Group have a number of talks coming up, which sound very interesting! Discover the true story of Chesterfield’s crooked tower – how it was done and why!